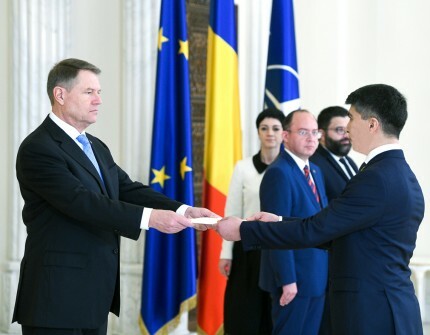 On January 29, 2019, the ceremony of presenting the letters of credence of the Ambassador of Turkmenistan to Romania A.Annaev to the President of Romania Mr. Klaus Verner Johannis was held in the Cotroceni Palace in Bucharest. The event was also attended by the Advisor to the President of Romania on political issues Mr. Bogdan Aurescu, the State Secretary of the Romanian Ministry of Foreign Affairs Mr. Danuz Sebastian Neculaescu, and the diplomats of the Embassy. During the talks with the President of Romania, Ambassador A.Annaev conveyed greetings and best wishes on behalf of President of Turkmenistan Gurbanguly Berdimuhamedov addressed to the President of Romania, and also confirmed the Turkmen side’s interest in further promoting and developing bilateral relations between Turkmenistan and Romania. In turn, the President of Romania, thanking for the warm greetings and wishes sent to him, expressed a request to convey his greetings and best wishes to the President and the people of Turkmenistan.